We had our neighbor over for dinner tonight and made this for dessert. It's Ty's favorite pie. 1. Whisk together sugar, corn starch, salt & egg yolks. Immediately add milks. 2. Cook over medium heat until thickened, stirring often. 3. Remove from heat, add vanilla & butter. 4. Cover and let cool at least 30 minutes before transferring to pie crust. 5. 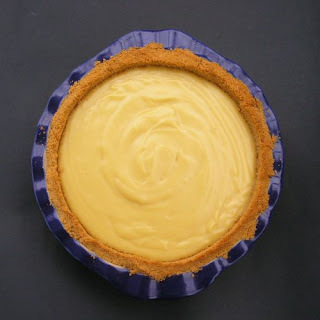 Put 1/2 of the custard in your pie crust, layer with banana slices, and top off with the other 1/2 of the custard. 6. Refrigerate for at least 3 hours. Serve topped with whipped cream.